Pleased to announce our partnership with WIRED25 as the event's digital experience agency. As a part of this relationship, Isobar will consult on digital experiences at the WIRED25 event, create a WIRED app for iOS and Android, and work with WIRED to curate a series of experiments that explore emerging technology and new forms of storytelling. Leading up to the event, Isobar will create a mobile application that will elevate the digital experience of the event and will live on as a WIRED app. In addition to creating the app, Isobar will consult on digital elements around WIRED25, looking for ways to weave emerging technology experiences into traditionally static ones. 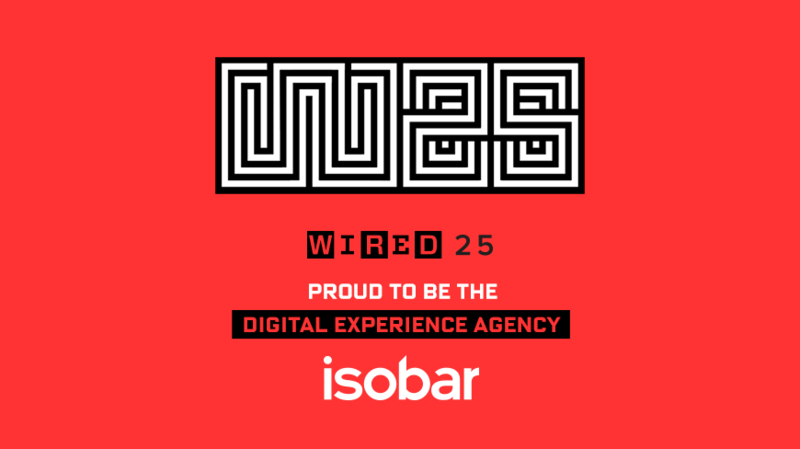 “We are thrilled to have Isobar on board as digital agency for WIRED25 and are excited to work with them on the development of an app that will improve the experience for those attending the event, those who can't make it, and ultimately all WIRED readers,” said Maya Draisin, VP of Marketing at WIRED. Since its first issue in 1993, WIRED has not only chronicled change, but led it, introducing big ideas that transformed the way the world thinks and documented the digital revolution. The WIRED25 conference is a four-day event honoring the ideas, innovations, and icons who have shaped the world we know today—and those who will shape it for the 25 years to come. Featured speakers include, Marc Benioff, Jony Ive, Fei-Fei Li, Satya Nadella, Sundar Pinchai, Kevin Systrom and Susan Wojcicki. WIRED25 takes place October 12 - 15, in San Francisco. Join us.